Udoka wasn't looking for the lob. Graham with his fifth turnover. Lightfoot in for Udoka. 2:34 to go. Lightfoot in for #KUbball - Azubuike saw him coming and clearly didn't want to come out. 2:34 to play. KU up five. Graham couldn't get the bounce. Seton Hall down 5. Pirates had 2 chances and couldn't convert. Huge stop. Mitch Lightfoot scowled after allowing that rebound. Was able to box out just enough on the next shot. Ball bounced to Malik Newman. Graham stared at fans in the front row and pumped his fist. KU up 8 with 70 seconds left. Jayhawks up 71-63 with 1:10 to play. Remember when this team went through its soft phase? Incredible defense down the stretch minutes all of the offensive rebounds. I would describe the front row of the Seton Hall fan section as what I looked like when I had pneumonia. KU has 31 rebounds, Delgado has 22. 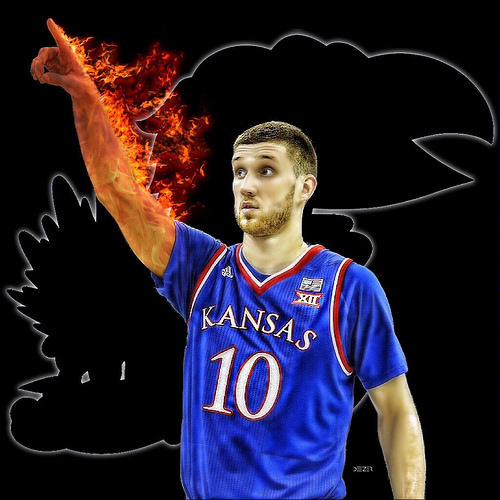 That is why Mitch Lightfoot is in the game and not Udoka Azubuike. He gets fouled on the rebound. FT time. Officials are checking the game clock... #KUbball leads 71-64 with 1:06 to play (for now)... Lightfoot headed to the FT line. Make them both and it's over? Vick almost with a turnover. That would've been huge. And refs will do another review. I am constantly wrong about these things, but looking off a monitor about 15 feet away that looks to be off Lagerald Vick. We weren't ready for the press. Replay looks like it's off of the back of 22's hand... Refs are looking at it. Should be #KUbball ball. After review, it's KU ball. Are the announcers trying to create interest? This isn't hard.